I am delighted to welcome you to my stop on the ‘Mumnesia’ Blog Tour the fantastic new book from Katie Dale. This hilariously, entertaining book is guaranteed to have you in stitches and reminiscing about the good old days of the 1980s. If you’re too young to remember the 1980s ask a parent or an older person, one of those people who was growing up when mobile phones where the size of a brick! Yes that’s actually true we don’t just make these crazy things up just to prove that you’ve got thing so much easier these days. It was the decade that fashion forgot, if you didn’t have plastic jewellery, leg warmers, and crimped hair – well you were never going to be in Bucks Fizz (again check with one of those grown up people). Meet Lucy, whose Mum Sharon is determined to totally ruin her life. She won’t let her have her ears pierced, mobile phones are forbidden and under no circumstances is she going to let her go to the biggest deal in the whole history of the school the Black and White ball. OMG poor Lucy! 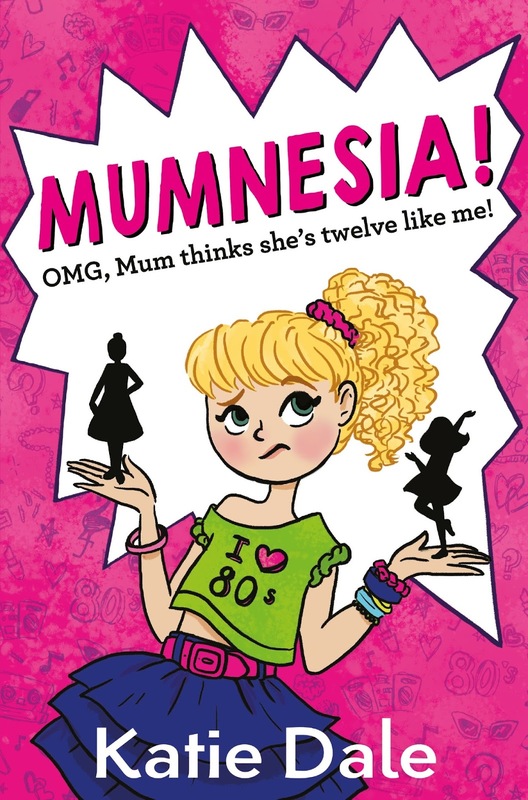 She wishes that for just one day her Mum would remember what its like to actually be twelve, But you know the saying ‘be careful what you wish for’, when Lucy’s Mum wakes up with no memory of the last thirty years and thinks she’s twelve years old, things don’t always turn out as expected. Be prepared for a rollercoaster of emotions and plenty of magnificent comic moments. It deals with a complex range of emotions and feelings that tweens experience and contrasts brilliantly life in the 1980s with today. The reality is although things seem very different a lot of the problems they face are still the same. Wonderfully funny and heart warming, this is a real joy of a read. Children will never look at their parents in quite the same way and may not be entirely trusting when they recount their versions of growing up. If you’re looking for something to make you laugh out loud and make you smile then this is the book for you. This is such a fun read that will totally brighten your day. 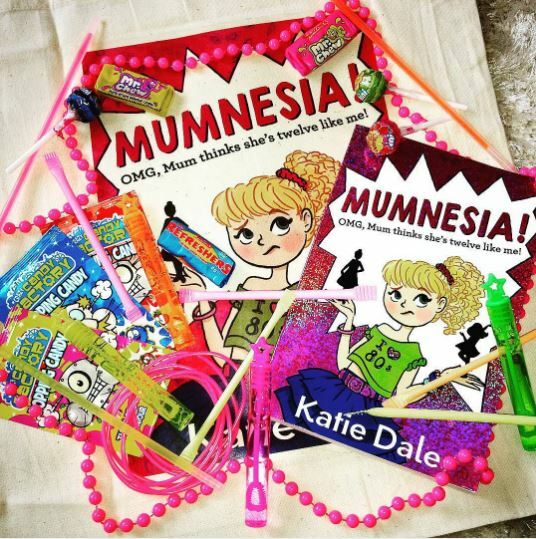 Katie Dale has kindly organised a competition to win a fantastic Mumnesia Goody Bag. Don’t forget to enter the MUMNESIA GOODY-BAG PRIZE DRAW! WHAT DECADE DOES LUCY’S MUM THINK SHE’S TIME-TRAVELLED FROM? A big thank you to Katie for inviting me to be part of the Mumnesia Blog Tour. If you’ve missed any of the other stops on the tour you can still visit and find the answer to all the questions to be in with a chance to win the goody bag. This entry was posted in Uncategorized on June 28, 2016 by bookloverjo. I’m really excited to be able to reveal for you today the cover of the lovely and talented Sharon Marie Jones debut novel. 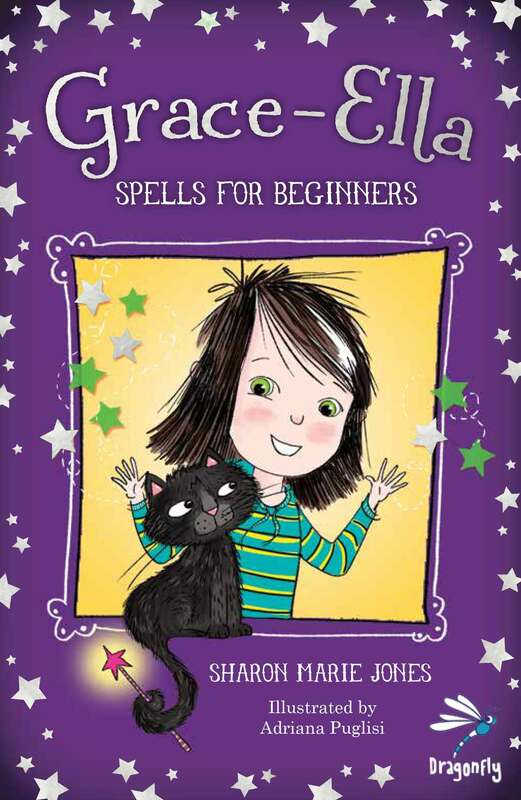 ‘Grace-Ella Spells For Beginners’, which will be published on September 15th by Firefly Press. I think the cover is just gorgeous, I love the striking colours and think it will be massively appealing to younger readers. The cover is designed by Claire Brisley and the illustration is by Adriana Puglisi. I’m a huge fan of Illustrated Fiction and this book features black and white illustrations throughout also by Adriana. I’m intrigued to find out what lies beneath that stunning cover so let’s find out more. Grace-Ella is thrilled when a black cat walks through their door. She’s always wanted a pet. But Mr Whiskins has a secret. On the ninth day of the ninth month of her ninth year, he tells Grace-Ella that she is a witch and can start learning magic with the Witches’ Council. Grace-Ella has never been good at school — can she learn to be a good witch? As well as struggling with lessons, Grace-Ella and her best friend Fflur are bullied by star pupil Amelia. The Witches’ Council forbids using magic against anyone. But how else can Grace-Ella protect her friends? Grace-Ella is a magical, funny adventure, the first in a new series, about friendship and being true to yourself. This story sounds truly delightful I know that it will really appeal to me and my daughters as we are slightly obsessed with witch stories. Who doesn’t secretly wish they could learn how to cast a magic spell? Or is it just me? Sharon Marie Jones was born and raised in Dolgellau, in North Wales. She studied English and Education at the University of Wales, Aberystwyth and graduated with First Class Honours. 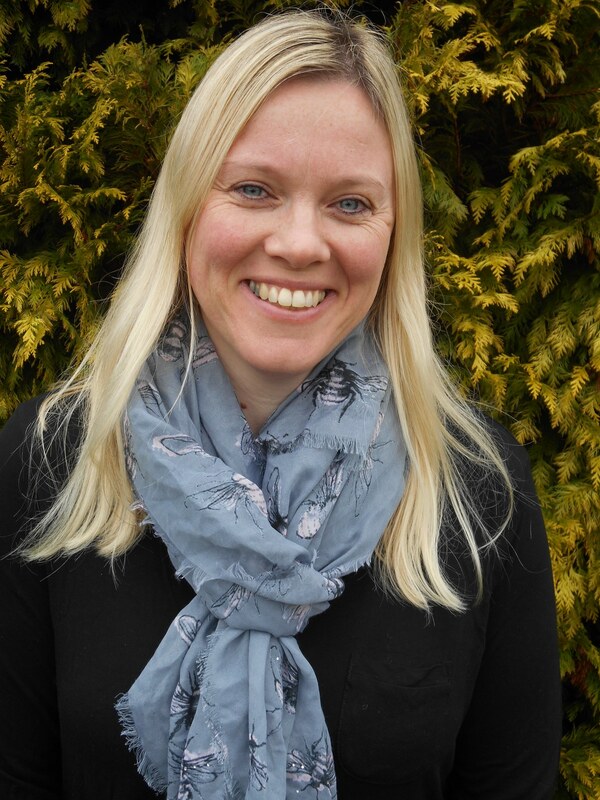 After completing a P.G.C.E course, she began a career as a Primary School Teacher and taught at Pontrhydfendigaid Primary School for the last 13 years but is now a full time author. She’s a mum to three young boys. Grace-Ella is her first book. ‘Grace-Ella Spells For Beginners’ is part of Firefly Press’s Dragonfly range for 7-10 year oldS set in contemporary wales. To find out more you can visit their website. A huge thank you to Sharon and Firefly Press for inviting me to do the cover reveal, I’m really looking forward to reading ‘Grace-Ella’, watch this space for a review coming in Autumn. This entry was posted in Uncategorized on June 24, 2016 by bookloverjo. 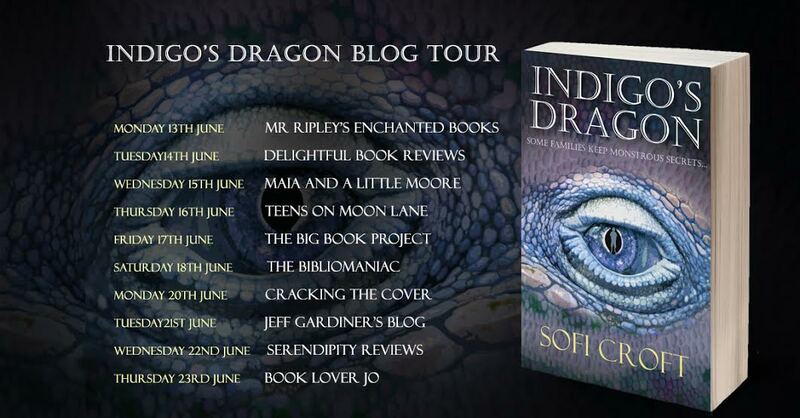 I’m delighted to welcome Sofi Croft to the blog today on the last day of the ‘Indigo’s Dragon’ blog tour for a guest post on her favourite dragons in children’s books. 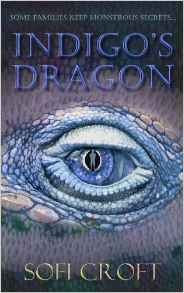 ‘Indigo’s Dragon’ is a new fantasy series full of adventure, mystery, monsters and dragons and is available to buy now. My 9 year old daughter and I both adore this book. Dragon is a friendly oriental dragon that accompanies Minli on a wonderful fantasy adventure. Many Chinese folktales are woven into the story, including how Dragon was born from a painting, the dragon’s pearl, and the dragon gate. This is a truly beautiful book, full of magical tales, gentle wisdom and gorgeous illustrations. Narnia is a childhood favourite of mine, and my children love the books just as much as I do. Eustace Scrubb’s transformation into a dragon in The Voyage of the Dawn Treader is a highlight of the series for me, and although Eustace’s time as a dragon is short lived it is incredibly memorable. This was my first encounter with the idea that a human could transform into a dragon and it completely captivated me. The Enchanted Forest Chronicles are entertaining, addictive reads. Kazul is a brilliant dragon; powerful and dangerous, but intelligent and reasonable. She employs the Princess Cimorene, who has run away to escape boredom and the prospect of marriage, as a cook, housekeeper, and to inventory her treasure. Kazul lives on a mountain with many other dragons, all with different personalities, and one of the things I love about this book is the dragon politics. There is a strong heroine in Cimorene, evil wizards, good witches, magic, a fast paced story, plenty of humour, and a strong message of bravery and courage to follow your own path. The Hobbit has been one of my favourite books ever since I read it as a child. Smaug both terrified and fascinated me in equal measure. He is like the dragons from fairy tales and legends – fearsome, greedy and ruthless – but he is also intelligent, cunning and hypnotic. I remember my blood pounding as I sneaked into his lair with Bilbo, and holding my breath in fearful anticipation during Bilbo’s conversations with Smaug. This is a fantastic series full of humour, action and adventure, and a great variety of dragon species with totally brilliant names and traits. The books have very different storylines to the movies, and it is well worth reading how Hiccup Horrendous Haddock the Third learns to train the tiny but fiercely independent Toothless. My children and I had so much fun reading about Hagrid’s difficulties raising a dragon. Although Norberta plays quite a small role in the book, she serves as a great introduction to dragons in the wizarding world. Dragons in the series are portrayed as impressive, dangerous beasts. I love the fact there are a variety of species, dragonologists who study them, and dragon dealers, who illegally trade in dragon goods. The Earthsea books are classic high fantasy, set a richly imagined world full of magic and spirituality. The series follows Ged, a young boy, on his journey to becoming a great wizard. The Dragon of Pendor is the first dragon he encounters, and is powerful, clever and proud. The dragons of Earthsea show characteristics of dragons from both western and eastern mythology; they are ancient and terrifying, but also full of magic and wisdom. Saphira is beautiful, wise, proud and fiercely loyal. Eragon, a farm boy, telepathically bonds with her when she hatches out of an egg. He raises her and eventually becomes a great dragon rider who battles monsters and evil magicians. Eragon and the other books in The Inheritance Cycle are great for fans of epic high fantasy but are not for the faint hearted. The books are full of adventure, wonder, danger, magic, brutal conflicts, and war. I love how realistic the dragon (called worm by the dragon slayer) is in this book. Part bird, part reptile, it is a fierce predator I imagine as a prehistoric beast that has remained hidden in the mountains for centuries. This adventure story follows Ansel, a nine year old mute boy, who has been sold to Johannes Brock, a dragon slayer. Brock is a charlatan who doesn’t really believe in dragons, but when he finds a girl called Else in the mountains, left as an offering to the dragon, he is forced to re-evaluate his beliefs. This book has descriptive language, beautiful scenery, interesting characters and an action packed climax. There are plenty of gorgeous picture books featuring dragons, but I think this one is my favourite. The dragon is a fierce, fire breathing force to be reckoned with, but is outwitted by the paper bag princess, who saves the prince and skips off into the sunset alone. I love the non-traditional gender roles and the unexpected ending. This is a fun series of short illustrated chapter books. The dragons are friendly and small, created from clay and magically brought to life. Each book features a different dragon, and each dragon has a special talent and role within the household. The stories are humorous and entertaining with positive messages. The dragons from this series also feature in The Last Dragon Chronicles, another great series of slightly longer books by the same author. You can find out more about Sofi by visiting her website or you can follow her on Twitter @croftdragon or on Facebook. In case you missed the rest of the blog tour you can still join in and read more reviews and fantastic guest posts. This entry was posted in Uncategorized on June 23, 2016 by bookloverjo. Scar McCall schoolgirl by day, cat burglar by night is on her most dangerous mission yet. When a heist goes awry, she inadvertently lets a cursed dagger fall into the hands of a master criminal, Delgado. Compelled to right this wrong, Scar convinces Ethan to embark on a risky raid to retrieve it before Delgado can unleash its power with a deadly sacrifice. 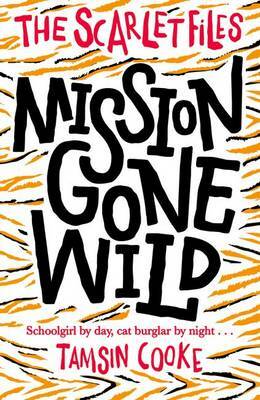 She must use her stealth, cunning and mysterious powers to succeed in her quest and will stop at nothing to protect the endangered animals who are under threat. Can she overcome all the odds and be back in time for school on Monday? This exciting follow up is exciting, pacey and full of drama. It is a non stop whirlwind of an adventure which will leave you wanting more. Full of danger and the unexpected we see Scar wrestling to control her mysterious abilities and being tested to her limits. More elements of her powers are revealed as Tamsin has more surprises in store for us, we never know just what effect the Aztec bracelet will have on Scar next. It is this element and suspense of the unknown which keeps me turning the pages. Full of twists and turns you will find it incredibly difficult to put this book down as you become totally enthralled in the story. A fantastic, thrilling read I’m really hoping there will be more to come from The Scarlet Files. Thank you to Tamsin and Oxford University Press for sending me a copy of this book. This entry was posted in Uncategorized on June 20, 2016 by bookloverjo. When my girls were small there was always a humorous competitive element between me and husband when reading bedtime stories. 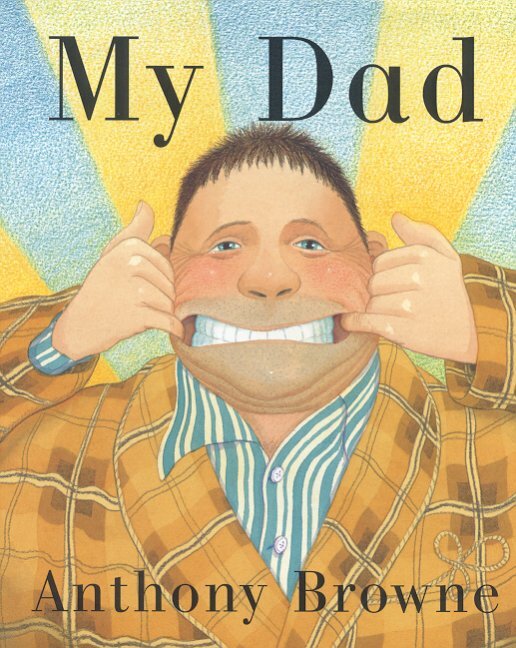 I would read ‘My Mum’ and he would read ‘My Dad’ both by Anthony Browne, these glorious celebrations of parenthood caused much hilarity as we both tried to outdo each other with our reading out loud abilities. I would sing like an angel (an angel whose foot had been stood on) and my husband would roar like a gorilla showing how big and strong he was, with lots of giggling from the girls as a result. 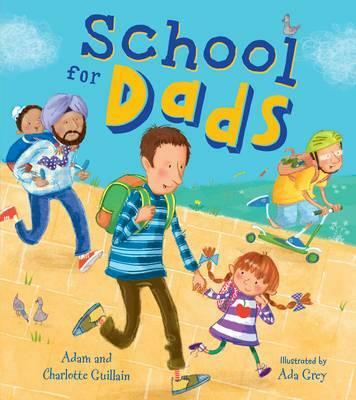 This year there has been lots of lovely new picture books celebrating Dads and I’m delighted to share them with you, so if your looking for inspiration then take a look. 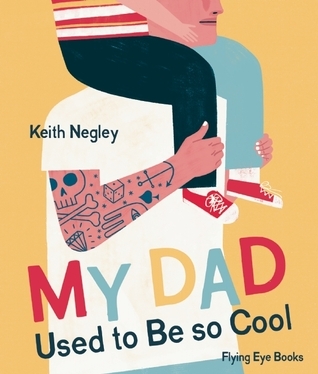 Keith Negley reveals a well hidden secret about parents in ‘My Dad Used to Be So Cool’, that shock horror we all had these ‘other’ lives before children. When you see us sleep deprived or demented on the school playground juggling playdates, packed lunches and our children’s social diaries its hard to believe that this could be possibly true. Dad has a cool past although he’s far from cool now! He used to be in a rock band but now seems to be serious and caught up in the mundane of domestic life, how could this Dad have been fun? This wonderful celebration of the relationship between a boy and his Dad captures perfectly the love and joy they share. The illustrations are simply stunning, using a limited but striking colour palette, each page is a total feast for your eyes. A really special, unique book I simply loved it. How do you find out if children will really like a book? 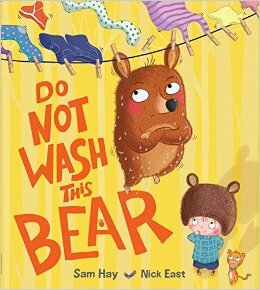 Read it to over 60 children and you will soon find out, that’s just what I did with ‘Do Not Wash This Bear’ with our reception class children. This fantastically funny story about a father and son who are left on their own is guaranteed to have you in stitches. The label clearly says ‘Do Not Wash This Bear’ but Dad doesn’t listen and pops Bear in the washing machine not realising that a very different bear will emerge. As Bear wreaks havoc around the house, Dad is oblivious despite his son’s best efforts. Can this naughty bear be stopped? Sam’s brilliant storytelling is perfectly matched by Nick East’s lively and energetic illustrations. Bright and colourful his expressions are magnificent and made me chuckle, he captures the naughtiness of bear superbly. A warm and funny tale I really enjoyed sharing this story. ‘School For Dads’ is a playful look at what would happen if children are put in charge to sort out their Dad’s errant ways. If Dad is too busy looking at his phone to play with you or is late picking you up then you have no choice but to send him to the School for Dads so he can learn just how he ought to behave. This story is a joy to read aloud, Adam and Charlotte create beautifully flowing rhymes that bounce along merrily as the story unfolds. Ada Grey’s illustrations are gorgeous and vibrant featuring a wonderfully diverse mix of characters which is really refreshing. Full of humour and warmth this book is a real celebration of fathers everywhere. 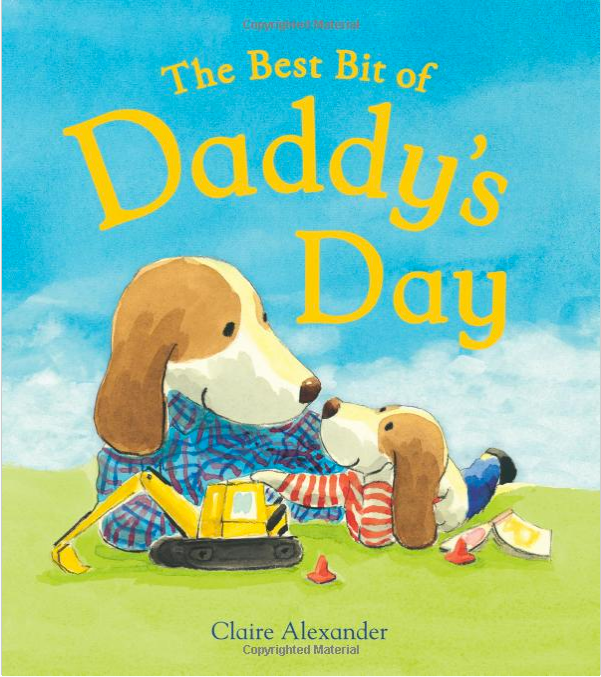 Claire Alexander’s has written a simply gorgeous story looking at the relationship between Bertie and his Daddy. When Bertie grows up he wants to be a builder just like his Daddy and drive trucks and diggers, so imagine his excitement when he arrives at school to find out they will be builders for the day. Bertie’s day doesn’t quite go to plan and when his Daddy picks him up he’s eager to confide in him the things that have gone wrong. But he is reassured when he finds out that even when you’re a grown up things don’t always work out and learns that they both looked for each other when they needed comfort. Claire’s illustrations provide a real emotional layer and charm to her stories, you can feel the bond and love shared by them. A truly lovely book which would be ideal to share a bedtime and help reassure a child who may feel anxious about being separated from a parent. Thank you to Egmont and Flying Eye Books for sending me copies of this book to review. This entry was posted in Uncategorized on June 17, 2016 by bookloverjo. 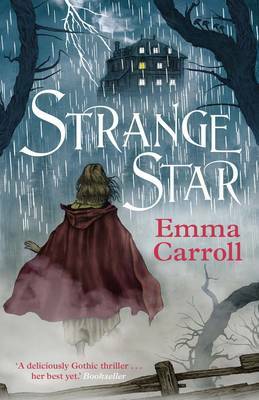 ‘Strange Star’ is a masterpiece in storytelling from Emma Carroll. Deliciously dark and wonderfully atmospheric it will send shivers down your spine and chill you to your bones. It is the year of 1816, a superstitious time when the advent of a strange sort of star in the sky makes folk uneasy and warns of terrible fortune according to the old lore. But who could possibly forsee the danger and tragedy that lies ahead for one family under the watchful eye of the comet. All is revealed on a stormy summer night in Lake Geneva, Switzerland. Lord Byron has gathered his friends round the fire, challenging them to tell a ghost story that will terrify the assembled company. Outside the thunder is crashing accentuating the fear and terror in the room, this is compounded by a ghostly figure suddenly appearing at the window. Yet real life is about to take a chilling turn- more chilling than any tale when there is a frantic thudding at the front door revealing a stranger. This girl is covered in the most unusual scars and has travelled a long way to tell her story and we have no choice but to listen to the horror that is about to unfold. This book delighted and terrified me in equal measures – although I must add a disclaimer that I am easily scared by spooky tales. Emma’s writing is brilliantly evocative conjuring up this mysterious gothic adventure which will hold you within its icy grip until you turn the very last page. Filled with rich, vivid descriptions capturing all the details of this period, you are left in no doubt that you have been transported back to this very point in time. I suspect that Emma Carroll may in fact have some kind of time travelling device because every story she tells feels so authentic you feel she must have been there to witness it happening. Without a doubt ‘Strange Star’ is one of my favourite books of the year, it is a truly stunning read. I treasured all the time I spent poring over the pages compelled to keep reading but apprehensive of what would happen next. It is mildly terrifying but in the right sort of way, it is more the fear of the unknown and the gothic atmosphere that creates the dramatic tension rather than gruesome details. I think the best place to read this story is late at night, under a blanket with only a torch to light the way – unless like me you’re of a sensitive nature. Gripping and gorgeous, this book is a total triumph which I absolutely loved. ‘Strange Star’ is released on the 7th July and you can pre-order a copy here. Emma is the critically-acclaimed author of ‘Frost Hollow Hall’, ‘The Girl Who Walked On Air’, ‘In Darkling Wood’ and ‘The Snow Sister’. You can read my review of ‘In Darkling Wood’ here. Thank you to Emma Carroll, Hannah Love and Faber & Faber for sending me a copy of this book. This entry was posted in Uncategorized on June 14, 2016 by bookloverjo. 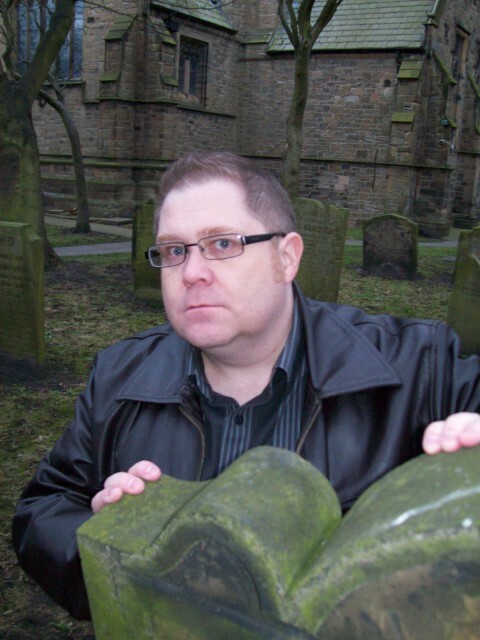 Today is my stop on the #tommyvcancer blog tour which has been organised to raise awareness and donations for the author Tommy Donbavand as he battles cancer. If you want to support Tommy you can buy or borrow his books from the library. You can also donate in the following ways via Paypal or Patreon. 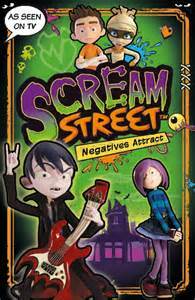 Tommy is the author of the fantastic Scream Street books which has been made into a brilliant animated series currently showing on CBBC. When we were trying to choose books to review on this tour the girls spotted these special editions in the bookshop and pleaded with me to buy them as they love the show. They follow the tale of Luke Watson who is just a regular teen apart from his werewolf gene. 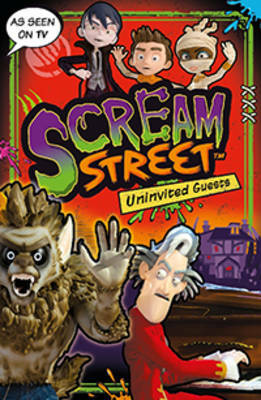 Along with his cast of friends Cleo the feisty teen mummy, Resus the sarcastic son of two vampires and Luella a trainee witch who spells tend to go wrong, you are guaranteed to have a brilliant time in Scream Street. As an apprentice witch, Luella is forbidden from casting spells unsupervised. But she has a major crush on Resus, the son of vampires, and if breaking the no-magic rule means solving Resus’s problems, she’s willing to take the risks. Whether trying to fix his parents’ stormy relationship with a love spell or seeking vengeance on the zombie rock stars who snub him, Luella follows her heart, with terrible – and hilarious – results. The two separate stories in this book are based on favourite episodes of the animated series, and are illustrated with photos from the show. This hilarious book is guaranteed to have you in stitches. It cleverly mixes really clever subtle humour with outrageous comic moments. The characters are well written and full of surprises. From Resus who dyes his hair black and uses false fangs to fit in with his family to Luke’s Dad who is permanently freaked out trying to come to terms with living in Scream Street but has moved there because his son is a werewolf. Nothing is quite what you expect! The gruesome details are really appealing with limbs falling off zombies, to blood pouring out of the sink instead of water, we never forget just what kind of street Luke is really living in. Irresistibly funny and entertaining we all loved reading this book, it gets a big thumbs up from me and the girls. You can buy a copy here. If you enjoyed this there is also ‘Univited Guests’ out now and ‘Snear Death Experience’ due for release in the Autumn. 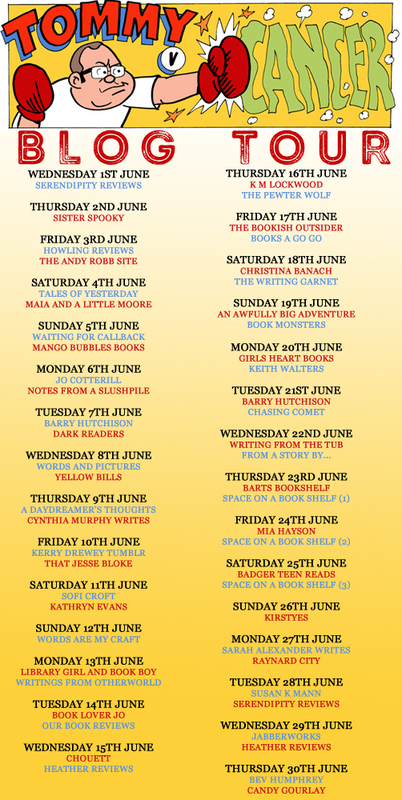 In case you missed it you can join in with this month long blog tour featuring lots of fantastic reviews and giveaways.